Before we give thanks for our many blessings this Thanksgiving season, let us set the record straight about one aspect of the Pilgrim story. The Pilgrims who landed at Plymouth in 1620 were not Puritans. Most were Anglicans (who had little desire to change the Church of England) or Separatists (who wanted to leave the Church entirely). Another common misconception is that all early Presbyterians in the American Colonies were Scots-Irish. In fact, a vital branch of Presbyterian history was formed by those same English emigrants we just removed from the Pilgrim story: the Puritans . First Presbyterian Church of Newtown, Long Island, NY, n.d. From Postcard Collection. The Puritans who sailed out of Lynn were searching for fertile soil to farm; they landed at Cow Neck near present-day Manhasset. Legend states that they tore a symbol of Dutch sovereignty from a tree, were arrested and imprisoned by Dutch officials, and only released after being warned to leave the island for good. But instead of sailing back toward Massachusetts Bay, they sailed farther east along Long Island, eventually making their way to Southampton. Around this time Puritans from near New Haven, in present day Connecticut, founded another settlement on Long Island called Southold . Several secondary sources state that the Rev. John Youngs, previously of England, formally organized a church there in October 1640. Many consider Southold the first Presbyterian congregation in America, as Rev. Pierson, the first minister at Southampton, did not arrive there until November 1640. Others, pointing out that Southold remained independent for its first 200 years, only joining the PCUSA’s Presbytery of Long Island  in 1831, give that distinction to Southampton. Additional Puritans, mostly from Connecticut, arrived in Long Island and established the remaining six churches. The Rev. Richard Denton, who came to America from England in 1630 with John Winthrop, the first colonial governor of the Massachusetts Bay Colony, founded Christ’s First Presbyterian Church in Hempstead  after sailing from Stamford. 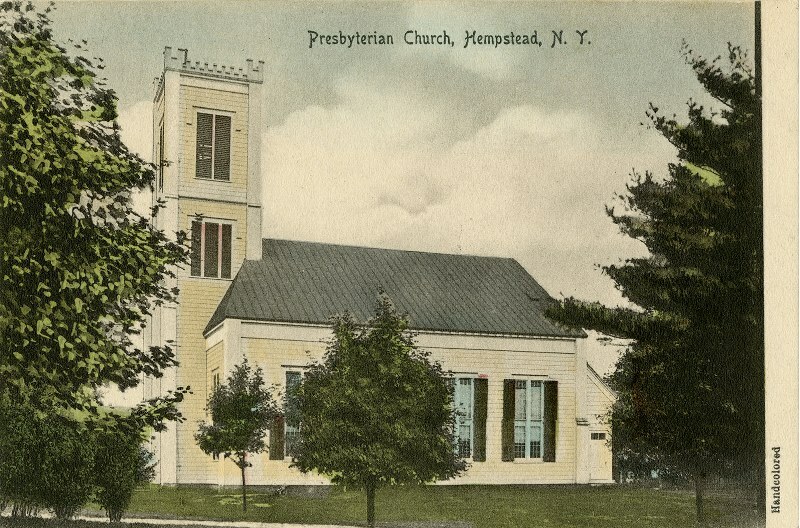 First Presbyterian Church, Hempstead, Long Island, NY, n.d. From Postcard Collection. 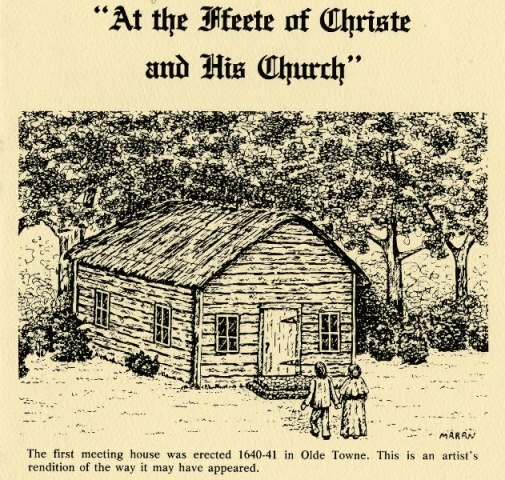 The first presbytery meeting in the American Colonies was held in Philadelphia in 1706. 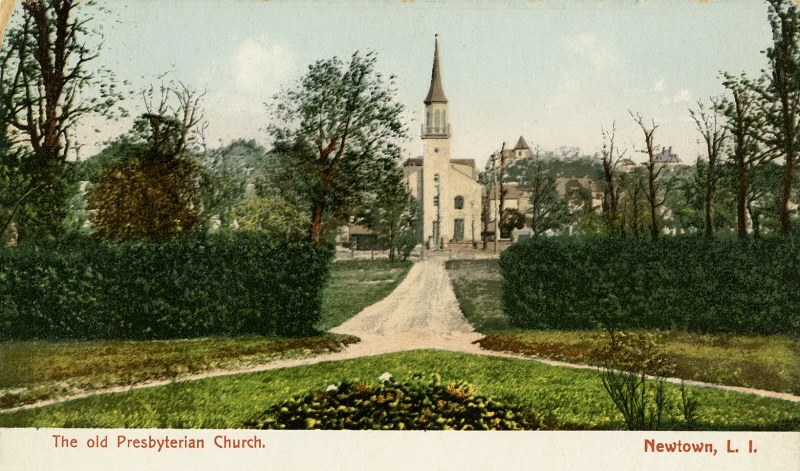 Ten years later, the First Presbyterian Church of Southampton joined “The Presbytery.” That 1716 meeting included two ministers representing three churches from Long Island. Southampton joined the newly formed Presbytery of Long Island in 1717. From cover of An Historical Sketch of the First Presbyterian Church in America, by Randall Lee Saxon, n.d. From FPC Southampton, NY, Congregational Vertical File. Puritans from Connecticut would go on to found additional churches beyond Long Island: the first Presbyterian Church in New Jersey, in Elizabeth , in 1664 (originally a Congregational church, it joined the Presbytery of Philadelphia in 1717); and the First Presbyterian Church, Newark , in 1666 (another Congregational church at its founding, which became Presbyterian in 1720). With Thanksgiving, we celebrate how the Pilgrim’s landing at Plymouth Rock set off a chain of events that created America. But let us not forget that it was the Puritans who played a major role in forming our common Presbyterian heritage—in New England, Long Island, New Jersey, and beyond. While conducting research for this blog post, I found instances where secondary resources contradicted each other. For example, one prominent scholar gives the founding date of Newtown as 1642, another 1652. This post is based on my own research, and all decisions about which resources to use are my own.